This granary weevil has set up shop inside a kernel. Even without wings, these stealthy stowaways — with the help of humans — have managed to infest grains all over the world for thousands of years. If you store grains in your pantry, you've probably had the unfortunate experience of opening a package or jar to find tiny bugs living inside. You're not alone — there are more than 200 species of these pesky grain insects ruining dinner plans around the world on a daily basis. It's no accident that they've made a home in your pantry — they've evolved along with humans. In a way, they contain a fascinating natural history of our own domestication. This is particularly true of the granary weevil. A reddish-brown beetle that turns up in oats, rice, corn, dry pasta and more, it's the only grain insect that has never been found outside of human food-storage situations. Most grain insects are equal opportunity pests — feasting on animals' food supplies in addition to our own. But the granary weevil has outplayed the others with a special adaptation that at first appears to be a disadvantage: It can't fly. Its wings have fused together, encasing it in a solid exoskeleton. (Imagine getting knocked around by grains the size of your own body — you'd definitely want a protective suit like the granary weevils'.) But that also makes it hard to get anywhere outside its pile of grain. And yet, the granary weevil has managed to infest grains all over the world for thousands of years. It even slipped its way into an Egyptian tomb — eating the grain meant for a pharaoh's afterlife. This puzzled Rudy Plarre, a scientist who studies insect pests at Freie University in Berlin. "They need to deposit their eggs to new food sources for the next generation," he said. "How is this done by a beetle that cannot fly?" He had a suspicion: Granary weevils are using us. To find out if he was right, Plarre decided to try to re-create the granary weevils' natural and cultural history. He started with the idea that human trade was key to its survival. Roughly past the dawn of the Neolithic Revolution about 12,000 years ago, humans began to trade grains among settlements. Before then, Plarre said it would have been virtually impossible for granary weevils to find enough food to survive, much less spread globally. The beetles act like stowaways, hiding as larvae within the kernel of a grain while they develop. "People would have traded grain that was infested because they didn't know it was infested," Plarre said. In other words, granary weevils don't find their way into your food after you put it into your pantry — the larvae are already there. The weevils' ability to remain undetected is more proof of their human-influenced natural selection. But if granary weevils are entirely dependent on human trade to reproduce, that means they would have branched off from other species of its genus, Sitophilius, and evolved on an incredible timeline. Evolutionarily speaking, 12,000 years goes by in a flash. The granary weevil likely came from humble beginnings, on the southwestern slopes of the Himalayan Mountains. That's where you can still find other species of Sitophilius living off tree fruits. When nearby humans began to farm and amass sizable stores of food, some Sitophilius populations saw an opportunity. "There are probably six to seven Sitophilius species," said Plarre. "Only three of them — sitophilius granarius, the granary weevil; sitophilus oryzae, the rice weevil; and sitophilius zeamais, the maize weevil — were able to make the evolutionary step into human environments." These weevils are now known as "cosmopolitan pests," meaning they made it out of their small mountain habitat to spread across the world. But unlike the granary weevil, the maize and rice weevils can fly, and they're still found roughing it outside human storage situations. Plarre believes that the granary weevil was the only insect pest to take it to the next level: Post-human contact, they lost their wings and hitched their destiny to ours. Signs of the granary weevils' success pop up throughout history. They were excavated from an Egyptian tomb dating back to 2300 B.C., as well as from stables in Amarna from mid-14th century B.C. Sumerian cuneiform tablets, one of the earliest forms of writing, mention grain-eating pests interpreted to be granary weevils. The beetles were found within volcanic ash and lava that preserved early Roman settlements in Santorini, as well as in other Roman settlements ranging from Italy up to York, England. As the Roman Empire spread throughout Europe, they unknowingly helped establish the granary weevils' empire, too. Later, granary weevils appeared in art and science. One specimen was depicted in a 1630 drawing by Italian scientist Francesco Stelluti, who was among the first to use a microscope to study nature. Dutch scientist Antonie van Leeuwenhoeck, who is considered the first microbiologist, used granary weevils to help disprove spontaneous generation, the long-held theory that new organisms can come from dead things. People apparently thought that the grains themselves were breeding the insects. Despite granary weevils' contributions to science and their faithful (clingy) companionship to humans through history, they have been bugging us the whole time. In response, we've been doggedly trying to annihilate the pest of our own creation. "There's a huge industry just built around managing these insects and keeping infestations from happening. It might be surprising just how much thought and effort goes into it all the way through the chain," said Jim Campbell, an entomologist at the USDA Agricultural Research Service in Manhattan, Kan. Humans wage battles against grain insects from the fields, to silos, to packaging and shipping, even on the shelves of your local grocery store. For much of the history of our co-evolution, humans had only the tools of creating dry environments and tightly sealed storage to fight pests like the granary weevil. Today, we have insecticides, sophisticated packaging, and even an "Infestation Destroyer" that uses centrifugal force to fling insects to meet their high-impact deaths. The effort is worthwhile. Campbell said that grain insects cause the loss of 2 to 5 percent of harvested grains in developed countries. That number shoots up to 50 percent in less-developed countries. It's difficult to quantify the economic effects, because they're distributed so widely through the manufacturing chain. 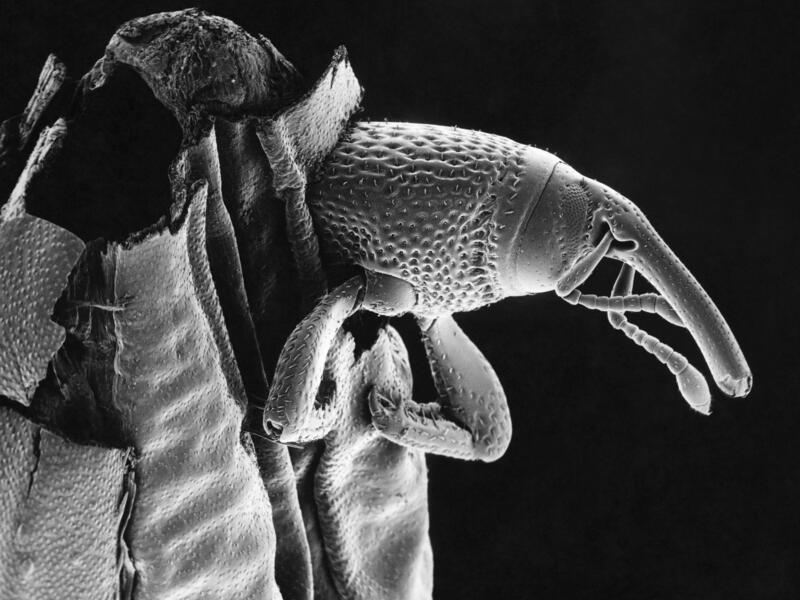 While granary weevils have evolved at an extraordinary pace, human progress might be faster than even those hard-core adapters can catch up with. "It's way more rare for people to find insects in their food than they did just a generation ago," said Campbell.